Orbital’s VE Technology features helical strakes in the body of its probes, utilising a design that eliminates vortex-induced vibration. The test, carried out on May 1, 2017, by a highly respected, North American independent metering research facility, proved the effects of vortex-induced vibration on traditional and helical probe geometries in a typical high-pressure, high-velocity pipeline environment. 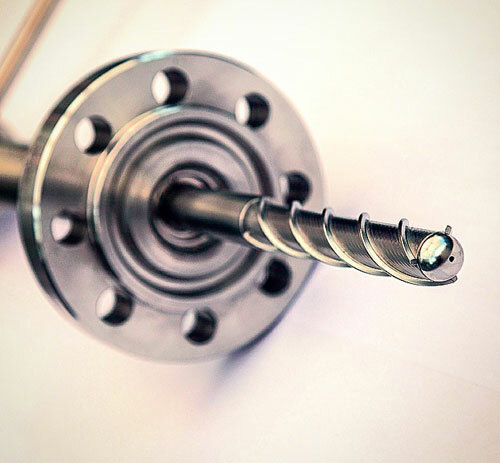 Orbital’s VE thermowell and a typical “ASME” straight shank thermowell were tested at high-pressure flows in the metering research facility’s High Pressure Loop (HPL). The HPL is a recirculating test loop used to simulate flowing conditions in natural gas transmission pipelines using distribution-quality natural gas as the flowing medium. The two thermowells were monitored at a series of flow rates corresponding to velocities from six to 110 feet per second. The results demonstrated that the ASME thermowell vibrated at allvelocities, creating a cyclic strain at the flange joint with clear visual in-line and transverse displacement (up to ±0.5 in.) at certain velocities corresponding to its natural frequency. The helical strake thermowell had no visual vibration and a measured strain more than two orders of magnitude less than the ASME thermowell. Measured strain at the flange/shaft joint was from 100 to more than 250 times greater in the ASME thermowell. Displacement at the tip was thousandths of an inch for the VE thermowell versus 0.5 inch for the ASME.